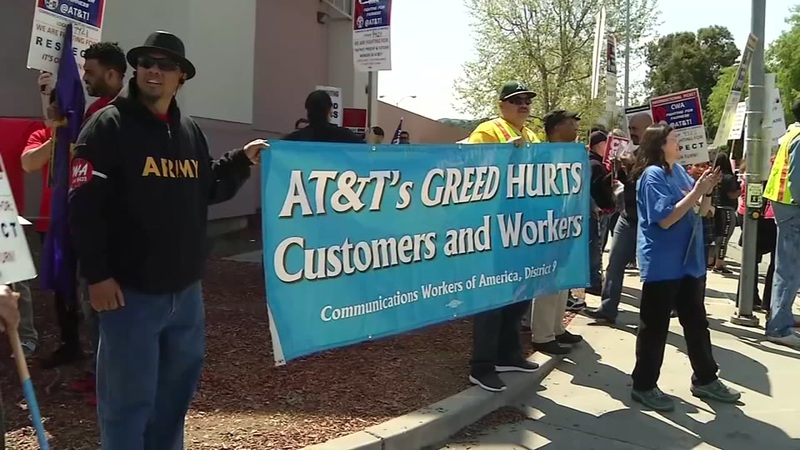 SAN JOSE, Calif. (KGO) -- AT&T employees protested outside of one of the company's stores in San Jose Sunday, demanding a better deal from their employer. At least 17,000 employees in California and Nevada have been working without a contract for a year now, so they want a contract that will guarantee their jobs and fair pay. A spokesperson for AT&T released a statement saying: "We continue to communicate with the CWA almost daily, and we look forward to reaching a fair agreement as soon as possible. We've been able to reach, and our union employees have ratified, fair agreements with 28 other CWA and IBEW bargaining units since the beginning of 2015, covering nearly 123,000 employees. That includes over 20,000 employees in the Southwest who on Thursday ratified a contract prior to expiration of their old contract. And it includes a group of IBEW employees in California who over six months ago ratified a very similar agreement to the one we are proposing to CWA, in bargaining that started about the same time. These are some of our most highly paid union-represented employees, and that will not change. For example, the average core network technician in this contract makes more than $148,000 in wages and benefits. Employees in this contract pay 40 percent less for medical care than the national average, and less than AT&T managers. And employees in this contract have a job offer guarantee that is virtually unheard of in the business world today, ensuring that if they are affected by a workforce reduction, the company will offer them another company job in the same state."